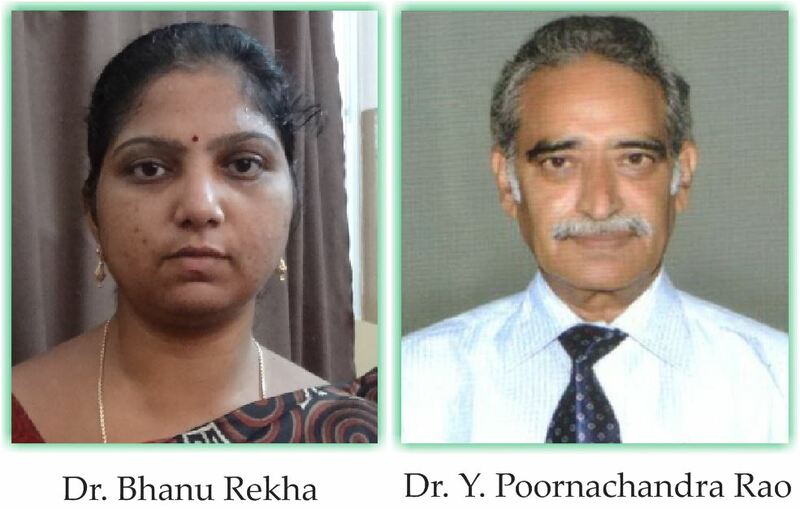 Dr Y Bhanu Rekha: Dr.Pinnamaneni Siddhartha Institute of Medical Sciences – Research Foundation Chinoutpally, Gannavaram Andhra Pradesh India. E-mail: nbrekha226@gmail.com. Giant cell tumour is a locally aggressive primary bone tumour, located eccentrically in the metaphysis and epiphysis of a long bone. 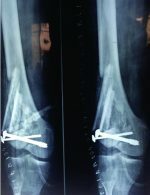 It commonly affects distal end of Femur, proximal end of Tibia and distal end of Radius. It is occasionally reported in small bones of hand and foot, spine and pelvis. Though it occurs in 20 – 35 year old individuals commonly, it can also be seen in children as young as 2 years and also in older individuals. We report an unusual presentation of Giant cell tumour in medial condyle and epicondyle of right Humerus which mimicked tuberculosis. A 26 year old male developed pain and swelling over medial aspect of left elbow 3 years ago. He was managed elsewhere at that time. X-ray showed ill-defined radiolucent lesion in the medial condyle of left distal humerus (Fig. 1). MRI showed osteolytic lesion in medial epicondyle and trochlea which was hyperintense on all the sequences. It was a well-defined lesion, and was extending into the soft tissue through a break in the medial cortex. Probably because of the rarity of GCT at this particular site, it was not thought of, and the lesion was suspected to be tuberculous osteomyelitis. Figure1 Intralesional curettage was done. Histopathological examination showed multinucleate giant cells and spindle cells with identical nuclei and the lesion was diagnosed as GCT. Pain and swelling recurred six months after the primary surgery. Patient came to our institution six months after the reappearance of the swelling i.e., one year after curettage. At the time of presentation, the elbow was in 50º of flexion and the range of motion was restricted to 50º – 90º.The swelling was 4”×5” in size, situated anteromedially just above the elbow joint. It was well-defined and bony hard in consistency. Egg-shell crackling was elicited. There were no signs of ulnar nerve involvement. Regional lymph nodes were not palpable. His Mayo Elbow Performance Score was 30. X-ray showed well-defined expansile osteolytic lesion in the medial epicondyle and part of the trochlea. Cortical destruction was seen medially, hence the tumour was graded as Grade III Giant cell tumour according to Companacci grading (Fig. 2). MRI showed breach in the medial cortex, with the tumour extending into the soft tissue. There was no infiltration into the joint or neurovascular structures (Fig. 3). There were no lytic lesions in the chest X-ray. Rest of all the investigations were unremarkable. The tumour was approached medially excising the previous scar. Pathological fracture of medial cortex was seen and the tumour was extending anteriorly outside the bone. The tumour was grayish in appearance and was firm in consistency. Ulnar nerve was isolated and protected. Enbloc resection of the tumour was done, including part of the trochlea (Fig. 4). Reconstruction was deferred as the joint appeared to be stable intra-operatively. Anterior transposition of ulnar nerve was done. Microscopic examination showed multinucleate giant cells and pleomorphic spindle cells (Fig. 5). Mitotic rate was <1/HPF. Post-operatively, neurovascular function was intact and the elbow was mobilized from third week post-operatively. Patient attained 10º -120º range of painless mobility. Post–operative Mayo Elbow Performance Score was 85 (Fig. 6 & 7). At present, patient has minimal pain while lifting weights with his left arm. There is no valgus instability with stress testing. Joint mobility is retained. X-ray chest and elbow taken six months, one year and two years post-operatively showed no recurrence or metastasis. The incidence of Giant cell tumour is 5% among primary bone tumors, of which 3% show metastasis in lungs. Though GCT is a benign bone tumor, it breaches the cortex and invades the soft tissues . It is mainly seen around the knee and away from the elbow. It is occasionally seen in the phalanges, frontal bone and sacrum. It is very rarely reported in the distal end of Humerus. Low degree of suspicion may be the reason for inadequate removal of the tumour during the primary surgery. Giant cell tumour in upper limb is considered to be more aggressive than the tumour in lower limb[1,6]. Many modalities of treatment are described for recurrent GCT. Intralesional curettage with cementing or bone grafting is preferred by many surgeons. But recurrence after these procedures is shown to be high (12%-65%). Resection of the tumour involving the whole distal humerus and reconstruction with total elbow arthroplasty is also described. Enbloc resection is chosen in our case as it is a Gr.III Companacci tumor. Since the lesion is involving the trochlea only partly, resection of the tumour and supporting the medial aspect of the joint with autogenous tricortical iliac crest graft is planned. But there is no instability after resection of the tumour and elbow movement is regained completely. So, reconstruction is deferred, to be done later if it is deemed necessary. Patient doesn’t opt for reconstruction when he is given the choice. Apart from having mild pain, patient is satisfied with the function of his left elbow. He attained 10º -120º of painless mobility. He is able to carry out his daily activities comfortably. His Elbow Performance Score has improved from 30 to 85. As is in the case of recurrent GCT, the tumor in our case also showed cellular pleomorphism. Patient is advised regular follow-up to detect local recurrence and metastasis at the earliest. But till date, patient is free of both. Though Occurrence of GCT is rare in distal Humerus, it should be considered in the differential diagnosis of any radiolucent lesion. Biopsy should be done to establish the diagnosis. With adequate resection, recurrence can be prevented and joint function can be preserved. 1.Michiro Yanagisawa, Kyogi Okada, Takahiro Tajino, Tomoaki Torigoe, Akira Kawai and Jun Nishida. A clinicopathological study of giant cell tumor of small bones.Ups J Med Sci.Nov.2011;116(4):265-268. 2.Christopher Martin B.S and Edward FMcCarthy. Giant cell tumor of the sacrum and spine: Series of 23 cases and a veview of the literature. Iowa Orthop J.2010;30:69-75. 3.Balke M, Streitbuerger A, Budny T, Henrichem, Gosheqer G, Hardes J. Treatment and outcome of giant cell tumor of the Pelvis. Acta Orthop.2009 Oct;80(5):590-6. 4. Kamoshima Y, Sawamura Y, Imai T, Furukewa H,Kubota K, Houkin K. Giant cell tumor of the frontal bone in a girl: a case report. Neurol Med Chir(Tokyo) 2011;51(11):798-800. 5. Edward F.McCarthyM.D and Kristy L.Weber M.D. Giant cell tumor of bone in elderly patients: a study of ten patients.Iowa Orthop J 2009;29:79-82. 6. K.A.Siebenrock, K.K.Unni, M.G.Rock. Giant cell tumor of bone metastasising to the lungs A Long-term follow-up. The Journal of Bone and Joint Surgery (Br)1998;80-B:43-47. 7. Klenke FM, Wenger DE, Inwards CY, Rose PS, Sim FH. Giant cell tumor of Bone: Risk factors for recurrence.Clin Orthop Relat Res.2011 Feb;469(21):591-9. 8. Azad Sait S, Manasseh Nithyanath, Vinoo M Cherian. 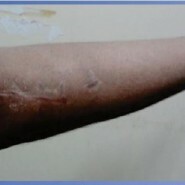 Giant cell tumor of the distal Humerus treated with Elbow arthroplasty: A Case report.IJCRI 2012;3(4):37-40.